Despite a home run from Ryan Howard and a pair of hits from Chase Utley, the Phillies were unable to beat the Rockies Thursday for the series win. 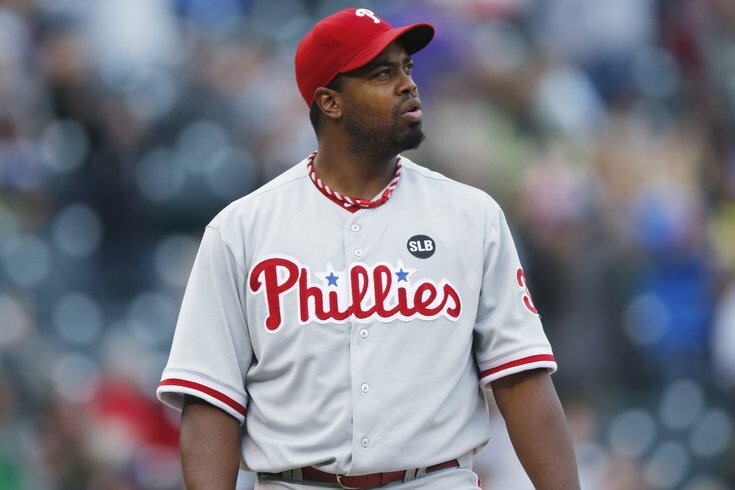 Starter Jerome Williams (3-4) allowed five earned runs in five innings to pick up the loss as the Phillies were forced to settle for the series split in Colorado, falling 7-3 in the finale of their four-game set. Williams just wasn't good. He allowed a pair of homers and several other hard-hit balls. He surrendered eight hits total and also walked 3 batters while failing to record a strike out. In fact, neither of the pitchers that followed -- Elvis Araujo and Jeanmar Gomez -- recorded a strike out. It was the first time since May 25, 2010 that Phillies pitchers failed to strike out an opposing player, when Jamie Moyer, David Herndon and Nelson Figueroa combined to do it in a 8-0 loss to the Mets. It's so rare, in fact that it's only happened 12 times since the start of the 2013 season and this marks just the eighth time the Phillies have "accomplished" the feat in the last 20-plus years. Sorry to burst your bubble, but the recent hot streak the Phillies found themselves on has just as much to do with their opponents as anything else. Even with today's loss to the Rockies, they've won seven of their last nine games, all of which have come against sub-.500 teams in the Rockies, Diamondbacks and Pirates. Those three teams were a combined 50-66 heading into play on Thursday. Furthermore, this recent offensive outburst -- it really started against the Diamondbacks and Rockies -- could have to do with the fact that those two teams are in the bottom half* of the National League in terms of runs allowed per game. All three are also in the bottom five in opponents' batting average. *The Rockies are dead last at 5.19 per game, a full run ahead of the league average (4.17), while the Diamondbacks are sixth from the bottom, one spot better than the Phillies (4.40), at 4.36 runs allowed per game. It's easy to dismiss what the Phillies have done against these teams, citing stats like those I just listed. But they can only play the teams on their schedule, and for a team expected to finish with the worst record in baseball -- they still may, especially if they start trading some of their better pieces -- it's nice to see them not just score runs, but win some games in the meantime. There's usually something funny about the lineup when the Phillies play a day game after a night game, but today, it wasn't quite what you would expect. Instead of Ryan Howard and Chase Utley getting the day off -- which you would expect even more so against left-handed starter Jorge De La Rosa -- it was Ben Revere. Even more interesting was Sandberg's decision to more Galvis to the leadoff spot and hit Utley second. I'd expect the order to return to normal when Revere returns to the lineup, but perhaps Sandberg is envisioning what the order will look like should the team trade* their leadoff hitter. *There have reportedly been talks between the Phillies and the Angels. ...but don't tell that to Ryan Howard. For as thin as the air is at Coors Field, the cool temperatures out there this week could have caused some of the team's hot bats, including Howard's, to go cold. Instead, it was quite the opposite. The Phillies first baseman hit his ninth home run of the season -- he didn't hit his first until April 21 -- and his second in as many games. Meanwhile, Chase Utley hit his first triple of the season as part of a 2-for-4 day. He should have had another hit, but what looked like an infield hit was ruled an error by the scorer in Denver, stealing a hit from the suddenly red-hot* second baseman. Maybe that's the bad luck Sandberg was talking about a few weeks back. *I wrote more about Utley's recent success earlier Thursday as part of a look at the Phillies' top trade chips. But it hasn't just been the right side of the Phillies infield that's been producing offensively. It's been the whole team. And they've been able to do it early, getting out in front of their opponents and allowing their starters to find a comfort zone. The Phillies added another run to that, as they opened the scoring with a Darin Ruf RBI single in the third inning. This time, however, they were unable to hold the lead, allowing the Rockies to score three in the bottom of the third. They briefly tied the game in the fifth at 3-3, but Colorado again had the answer, scoring two in the home half of the same inning to go up for good. The difference between today and the eight games the Phillies have won in their last 10, was that the bottom half of the order failed to produce, well, much of anything. The first four batters -- Galvis, Utley, Ruf, and Howard -- went 6-for-16 with a home run, triple and double. They also drove in and/or scored all three of the Phillies run. The rest of their batters combined to go 1-for-16 with three walks. The Phillies had a pair of errors Thursday -- both coming from players known for their defense -- although neither wound up resulting in runs for the Rockies. In the first inning, it was Maikel Franco with the throwing error that allowed Carlos Gonzalez to advance to scoring position with two outs. Luckily, starter Jerome Williams was able to get Troy Tulowitzki to fly out to center field to end the inning. In the fourth, things could've been much worse, as a errant throw from Freddy Galvis* pulled Ryan Howard off the first base bag, causing pitcher Jorge De La Rosa to be safe at first with no outs. It's never good to allow a pitcher to start the inning by getting on base, but Williams again bailed his teammate out, retiring the top of the Rockies' lineup in order to get out of the inning. *Galvis should've had a second error in the seventh, but the scorer ruled it a base hit. Check out the note above about Utley's hit being ruled an error. Utley's was actually a base hit, and this was actually an error. You got to love those hometown scorers. On the opposite end of the spectrum is what right fielder Jeff Francoeur did between the two errors. With the Rockies already plating two in the third to take the lead, and threatening to add more with the bases loaded and just one out, Francoeur fielded a Brandon Barnes single, and came up firing. Gonzalez had already scored from third to give the Rockies their third run of the inning, but the fact that Frenchy was able to make the throw to get Tulowitzki and prevent any more damage helped the Phillies stay in the game. The next batter, Daniel Descalso, grounded out to end the inning. They would tie the game two innings laters on Howard's homer. For more on the backstory from Rich Hofmann, click here. The Phillies now travel to Washington to take on the first place Nationals before heading to New York to face the Mets to cap off their 10-game road trip. Their next home series will begin a week from tomorrow, when they host the Rockies at Citizens Bank Park. Tomorrow's game in D.C. is scheduled to get underway at 7:05 p.m. and features Sean O'Sullivan for the Phillies against Max Scherzer for the Nats.